The U.S. Environmental Protection Agency (EPA), in collaboration with the U.S. Geological Survey (USGS) and the National Oceanic and Atmospheric Administration (NOAA), has released a report that discusses the impacts of sea level rise on the physical characteristics of the coast, on coastal communities, and the habitats that depend on them. The report, Coastal Sensitivity to sea level Rise: A Focus on the Mid-Atlantic Region examines multiple opportunities for governments and coastal communities to plan for and adapt to rising sea levels. Here you can also download chapters 7-9 from Part II: Societal Impacts and Implications. Chapter 6 is available to read online, and you can download the pdf of that chapter there. 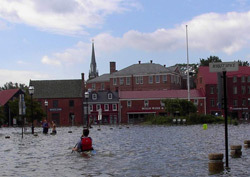 The previous chapters in Part I examined some of the impacts of sea level rise on the Mid-Atlantic, with a focus on the natural environment. Part II examines the implications of sea level rise for developed lands. Although the direct effects of sea level rise would be similar to those on the natural environment, people are part of this “built environment”; and people will generally respond to changes as they emerge, especially if important assets are threatened. The choices that people make could be influenced by the physical setting, the properties of the built environment, human aspirations, and the constraints of laws and economics. The chapters in Part II examine the impacts on four human activities: shore protection/retreat (21 pp, 13.5MB), human habitation (14 pp, 3.2MB), public access (8 pp, 5.1MB), and flood hazard mitigation (18 pp, 6.4MB). This assessment does not predict the choices that people will make; instead it examines some of the available options and assesses actions that federal and state governments and coastal communities can take in response to sea level rise. As rising sea level threatens coastal lands, the most fundamental choice that people face is whether to attempt to hold back the sea or allow nature to takes its course. Both choices have important costs and uncertainties. “Shore protection” allows homes and businesses to remain in their current locations, but often damages coastal habitat and requires substantial expenditure. “Retreat” can avoid the costs and environmental impacts of shore protection, but often at the expense of lost land and—in the case of developed areas—the loss of homes and possibly entire communities. In nature reserves and major cities, the preferred option may be obvious. Yet because each choice has some unwelcome consequences, the decision may be more difficult in areas that are developing or only lightly developed. Until this choice is made, however, preparing for long-term sea level rise in a particular location may be impossible. What are the technologies available for shore protection and the institutional measures that might help foster a retreat? What is the relationship between land use and shore protection? What are the environmental and social consequences of shore protection and retreat? 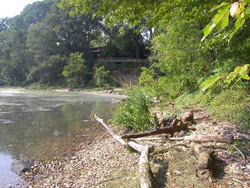 Most areas lack a plan that specifically addresses whether the shore will retreat or be protected. Even in those areas where a state plans to hold the line or a park plans to allow the shore to retreat, the plan is based on existing conditions. Current plans do not consider the costs or environmental consequences of sustaining shore protection for the next century and beyond. The chapter includes text boxes on the historic use of dikes and elevating land surfaces in the mid-Atlantic. One of the most important decisions that people make related to sea level rise is the decision to live or build in a low-lying area. Chapter 7 provides an uncertainty range of the population and number of households with a direct stake in possible inundation as sea level rises. The results are based on census data for the year 2000, and thus are not estimates the number of people or value of structures that will be affected, but rather estimate the number of people who have a stake today in the possible future consequences of rising sea level. Because census data estimates the total population of a given census block, but does not indicate where in that block the people live or the elevation of their homes, the estimates in Chapter 7 should not be viewed as the number of people whose homes would be lost. Rather, it estimates the number of people who inhabit a parcel of land with at least some land within a given elevation above the sea. The calculations in this Chapter build quantitatively on some of the elevation studies discussed in Chapter 2, and consider uncertainties in both the elevation data and the location of homes within a given census block. Chapter 7 also summarizes a study sponsored by the U.S Department of Transportation on the potential impacts of global sea level rise on the transportation infrastructure. Chapter 8 (8 pp, 5.1MB) looks at the implications of sea level rise for public access to the shore. The published literature suggests that the direct impact of sea level rise on public access would be minor because the boundary between public and private lands moves inland as the shore retreats. But responses to sea level rise could have a substantial impact. One common response (publicly funded beach nourishment) sometimes increases public access to the shore; but another class of responses (privately funded shoreline armoring) can eliminate public access along the shore if the land seaward of the shore protection structure erodes. 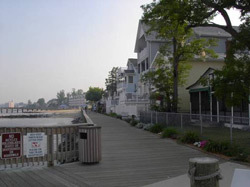 In parts of New Jersey, regulations governing permits for shoreline armoring avoid this impact by requiring property owners to provide access along the shore inland of the new shore protection structures. Finally, Chapter 9 (18 pp, 6.4MB) examines the implications of rising sea level for flood hazard mitigation, with a particular focus on the implications for the Federal Emergency Management Agency (FEMA) and other coastal floodplain managers. Rising sea level increases the vulnerability of coastal areas to flooding because higher sea level increases the frequency of floods by providing a higher base for flooding to build upon. Erosion of the shoreline could also make flooding more likely because erosion removes dunes and other natural protections against storm waves. Higher sea level also raises groundwater levels, which can increase basement flooding and increase standing water. Both the higher groundwater tables and higher surface water levels can slow the rate at which areas drain, and thereby increase the flooding from rainstorms. Chapter 9 opens with results of studies on the relationship of coastal storm tide elevations and sea level rise in the Mid-Atlantic. It then provides background on government agency floodplain management and on state activities related to flooding and sea level rise under the Coastal Zone Management Act. Federal agencies, such as FEMA, are beginning to specifically plan for future climate change in their strategic planning. Some coastal states, such as Maryland, have conducted state-wide assessments and studies of the impacts of sea level rise and have taken steps to integrate this knowledge with local policy decisions. The chapter includes text boxes on case studies on the ecological effects in North Carolina and flooding in Maryland. The chapters in Part II incorporate the underlying sea level rise scenarios of this Product differently, because of the differences in the underlying analytical approaches. Chapter 6 evaluates the population and property vulnerable to a 100-centimeter rise in sea level, and summarizes a study by the U.S. Department of Transportation concerning the impact of a 59-centimeter rise. Chapters 7, 8 and 9 provide qualitative analyses that are generally valid for the entire uncertainty range of future sea level rise. For previous reports focused on the implications of rising sea level, go to the More Sea Level Rise Reports.